Wallpapers are digital images (drawings, photos, art) used as a decorative background of a graphical user interface on the screen of a computer, smartphones and other devices. Wallpapers are also known as desktop background, desktop pictures or desktop wallpapers. Having to look at the same old style of desktop wallpaper can get pretty boring sometimes. 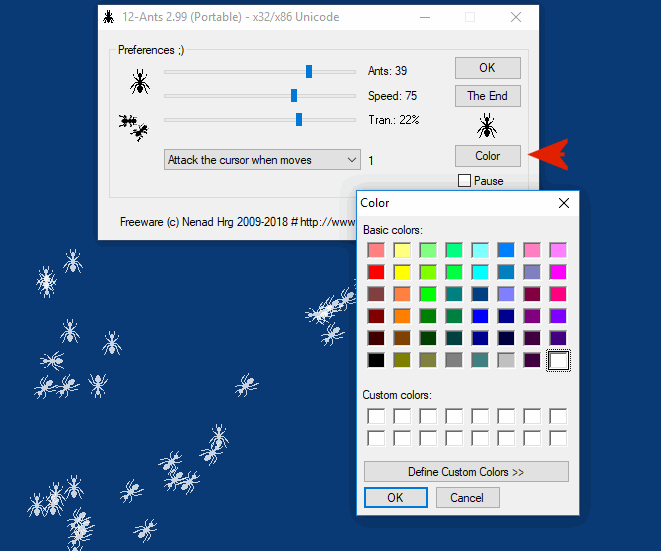 To spice things up a little bit, you can obtain a desktop enhancement utility like 12-Ants. This lightweight application livens up your desktop by placing a few numbers of ants around your desktop. The user interface is simple and straightforward; designed to perform only one function, which is what the application is built for. You can decide the number of ants (from 3 to 50), change their speed and color and adjust their level of transparency. 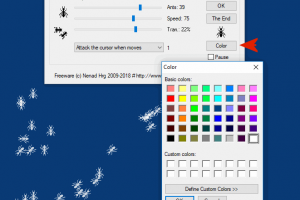 The application provides you with an option of five movement types to choose from: ants attack the mouse cursor, ants attack the cursor when it moves, ants fleeing from the cursor, ants flee when the cursor moves, and to stroll around (the ants). In addition, you can pause it stop the animation. The application is a portable tool and therefore, it does not need to be installed for it to work. You download the zip folder, extract the executable file to either the local storage or an external USB storage and run it on your system. Overall, this application can come in handy whenever you want to liven your desktop. 12-Ants is licensed as freeware for PC or laptop with Windows 32 bit and 64 bit operating system. It is in wallpapers category and is available to all software users as a free download.